Objectives: To act as a cultural liaison between the USA, ROC, and PRC, in order to promote peace and mutual understanding. To protect China's cultural heritage and environment from being sacrificed in the name of economic development. 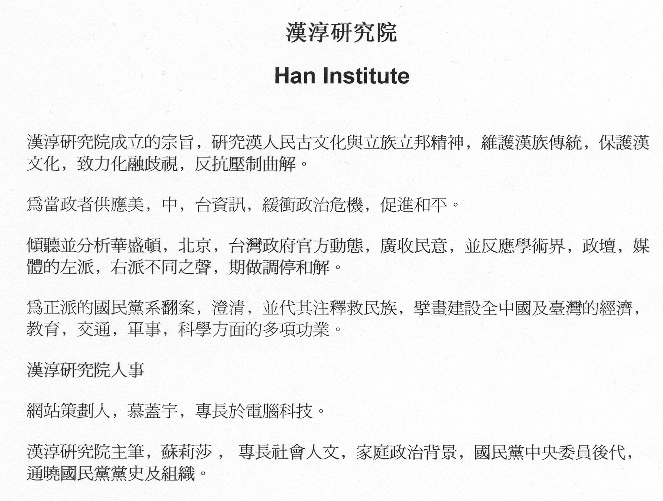 The Han Institute is a new wave organization assisting the world to understand and preserve an ancient civilization. We examine Han culture, and support and defend its good values. We assist the U.S. government, decision makers in China, and the Taiwan government to forge a balanced relationship. We assist the political scientists and foreign policymakers in offering insightful views into the history of Taiwan, China, and the United States in social, economic and political aspects. We make recommendations for Chinese president Hu Jin Tao, Taiwan president Ma Ying-jeou, and American president Barack Obama and their teams in dealing with the international relationships with the benefit to most of the people in mind. At this historically changing juncture, we will be awarded if the independence and unity issue can be resolved. Our services are to provide immediate interpretations and translations of the important words released. To provide the sentiment. To reflect the people's wishes. We maintain an open forum in important issues such as Independence vs. Unification. Providing bilingual Chinese-to-English and English-to-Chinese translation. We monitor important public issues released by Washington, Beijing, and Taipei. We work with publishers in works related to Han culture and Nationalist history. We work on database, documentary films, and compilation of oral history services.